Due to its unpredictable weather, there is surely no season more difficult to navigate through than winter. One minute it’s a blizzard, the next week it’s 65 degrees and sunny. The most exciting part about this part of the year is just how close spring feels and we’re getting ready by picking up a few (or, OK, a lot of) transitional pieces to help make the switch to warmer temps an easy one. As we wait for it to get warm enough for T-shirts and sundresses, we’re investing in options that can both keep us warm while it’s still breezy, but can still look chic when it finally gets warmer out. Luckily, we found this error-proof piece and it’s necessary to weather any and all temps. 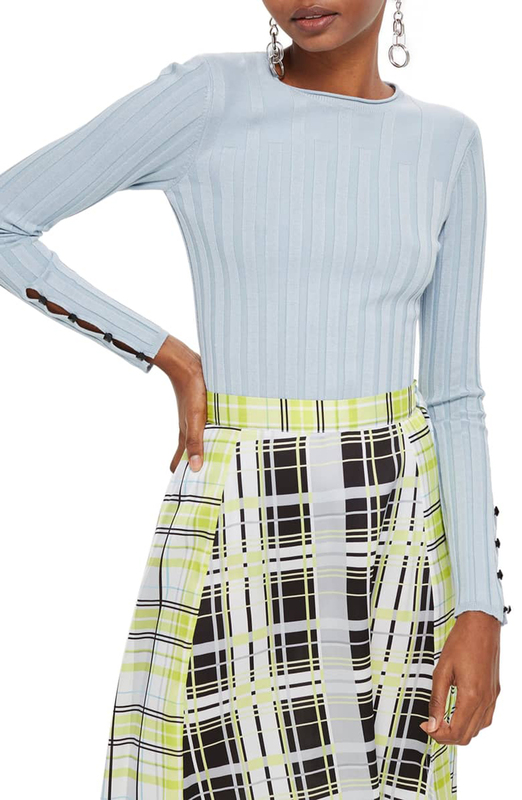 See it: Grab the Topshop Ribbed Sweater for $40 available at Nordstrom! Good news: the key to finishing out the tail end of winter on a high note isn’t a fancy topcoat. It’s a do-it-all knit that can be paired with just about anything. The Topshop Ribbed Sweater is the perfect sweater solution for any type of weather. The lightweight knit features studded buttons and a wide ribbing for an added textural element. Reviewers dig the sweater just as much as we do! Right off the bat, reviewers couldn’t stop chiming in on the ultra-flattering fitted sweater. Similarly echoing these reviews, additional reviewers continue praising the sweater on its feminine-yet-fabulous design. One reviewer even goes as far as claiming it is “the best Topshop, top, ever”. Of course, we can’t help but love her review. Dozens of buyers love how the universally flattering sweater has plenty of styling opportunities. They love how a relatively simple (yet undeniably stylish) staple made such a difference in both their winter and spring wardrobes. They were pleasantly surprised at how versatile and transitional this sweater could be. All fashionistas know that one solid, error-proof piece is a wardrobe must-have. And what better piece to style than this sweater? It can be worn alone, or layered under a vest, a jacket or a thicker knit to keep toasty warm on chilly days. Why throw shade when shoppers can, in fact, wear this sweater in the endless shades available? There is simply no wrong way to wear this ribbed sweater as it is available in basically every color, including black, blush, charcoal, forest, light blue, mustard and tobacco. Aside from all of these endless colors? The endless styling options! This sweater is anything but simple and the endless styling options available prove just that. Sure, we can’t help but love the fail-proof blush, black and charcoal shades available, but we can’t help but dabble with the brighter and bolder colors as well. Plus, why have one favorite when we can have more? Our two most-loved shades have to be the forest and tobacco hues. The forest shade is a divine, jewel-toned green and the tobacco is an equally ravishing, rustic red-orange. Call them our new basics, because we are already pairing them with everything. Pair a crisp, white button-up underneath this sweater. Reach for either a flared pair of overalls or a pair of skinny jeans to tuck the sweater into. Lastly, finish off with a delicate and detailed crossbody or a classic-and-chic tote. Talk about an updated approach to our tired, everyday uniform! Don’t want to blend in? This sweater was made for standing out, too! We’d recommend pairing this sweater with denim, fleece or leather jacket. Surely any and all options will look fashion forward underneath a boxy coat. Finish this off with an oh-so-fabulous, low-heel mule. Reviewers agreed that the top was made to hug the body, so either size down for a form-fitting look, or stick with your go-to size for a more comfortable feel. We can go on and on about how absolutely amazing this sweater is but don’t take our word for it, take the reviewers and test out the sweater that reviewers are calling “5-star worthy”! See it: Grab the Topshop Ribbed Sweater for $40 available at Nordstrom! Not your style? Check out additional sweater options available at Nordstrom! This post is brought to you by Us Weekly’s Shop With Us. The Shop With Us team aims to highlight products and services our readers might find interesting and useful. Product and service selection, however, is in no way intended to constitute an endorsement by either Us Weekly or of any celebrity mentioned in the post.